American Express Cardmember Gift Card Loyalty Promotion: Finally! OMG My Wife Finally Got a Free Gift Card from American Express For Her Loyalty! Back in late 2016 American Express surprised a select few Platinum cardmembers with free Amazon Echo devices. They didn’t have to sign-up for anything and there were no strings attached. It was simply a gesture of thanks from Amex to those lucky customers. I was jealous. In 2017 they stepped up this program by once again offering gifts to a seemingly random (although probably not) group of customers. Some people received $250 Blade gift cards while others got $250 Tiffany and Co. gift cards. Yes, as you might have guessed, my jealousy grew. Why no love Amex? A couple of days ago I had heard that a new round of gifts was starting to go out. This time the amount was less, but some people I know reported getting a $100 Bally gift card. As you might have guessed the jealousy once again bubbled up. That is until I got the mail today. Okay, they actually didn’t send me the gift card (despite my 16 years of being a loyal customer 😉 ), but instead sent it to my wife. The gift card came in the nice envelope shown at the top. I immediately knew it had to be something good so I ripped it open without waiting for my wife to return from the other room. Inside was a nice color folded insert. After flipping through the many folds and learning a bit about Bally (I admittedly didn’t know a lot about the company), I found the good stuff. Yes, I my wife is the proud owner of a $100 gift card. Yes, it does have an expiration, but just as with the Blade and Tiffany gift cards before it, there is no minimum purchase. Well I am ready to give up on getting a gift from them! Curious how much does she spend annually on the card? Not too much on her Platinum. Probably around $100-$125K across all of her Amex cards. You opened your wife’s mail?!?!?! Just a joke. She was right here. 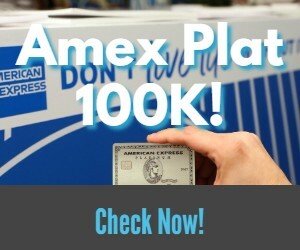 35+ years as a card member, putting significant spend on this card – where’s the love Amex?!! Spending about $2.5 million per year on platinum, and haven’t received anything like this. Oh well. Hmmm. I’ve been a loyal Amex customer for nearly 30 years and I’ve never received a complimentary anything. Ever. I’m glad that your wife received that gift though. Putting all my spend on Amex the last year. No love for me! George on Am I Alone? Does Anyone Else Still Print a Boarding Pass Every Trip?